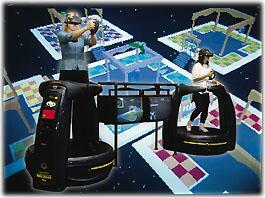 Virtual Reality is the new technology that allows people to experience new environments simulated on computers. But unlike conventional computer programs that display information on a fixed video monitor, Virtual Reality programs display computer images in a head-mounted display. This enables the user to see different parts of the environment simply by turning his head as he would in the real world. Add to this simulated sounds and a multi-function handgrip to control movement, and the user can explore the computer-generated world with a high sense of realism. The simulators provide a high-tech, fast action, non-encumbered playing environment. NEW! Hop into our Motion Simulator and ride a virtual rollercoaster — it’s the most fun you can have without leaving your seat! Video clip here. Acrobats and Gymnastic Shows • Actors/Actresses & Celebrities • Aerial Promotions • Airbrush Tattoos, Face Painting, T-Shirts, Etc. • Animal Acts • Aquatic Shows • Arts & Crafts Stations • Asian Name Brush Artist • Balloon Artists • Bands & Musicians • Los Angeles Party Entertainment Can’t find enough Bar Mitzvah Entertainment options? ECParties has great listings of hundreds of ideas to get your event going and keep your guests talking. Try looking for more on ECParties.com Make your next party a SNOW PARTY! Click to find Snow for parties Party Carts are a great way to add food and fun to your event Everything Parties is a great resource for planning services A great site for more planning and services ECParties planning services, Los Angeles Party, Snow Parties, Picnic Fun. The Casino Night, Murder Mystery Dinner, Hallelujah Hollywood, Winter Wonderland, Carnival, 1950's, Groovy 60's Party, and many more! ©2019 The Entertainment Contractor, LLC. All rights reserved. Start here to get suggestions for your event!